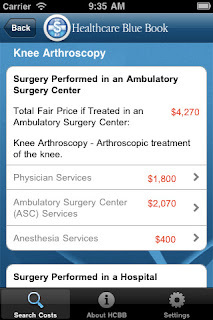 Healthcare Blue Book is a free medical app developed by CareOperative LLC. This app lists price ranges and a localized "fair price" for common medical tests, procedures, and physician services. For example, the Medicare Facility Limiting Price for a high level initial inpatient visit (CPT 99223) is $213 (national base rate). The Healthcare Blue Book indicates that the fair price for the same service is $333 for my local area. This app is by no means comprehensive, but it is an interesting tool to evaluate medical costs - making it useful for patients, students, residents, and anyone who would like to learn more about the costs of healthcare services.